Vestigia delle Terme di Tito e loro interne pitture, Rome 1776. While I was searching the internet for pictures of the frescoes at Domus Aurea, I discovered a site with many good photos as well as various engravings. As the page is written in Italian, I cannot be absolutely certain of the text even with Bing Translator. However the author speaks of Francisco de Holanda, who was in Rome between 1537 and 1540, in the aftermath of the discovery of the caves of the baths of Titus, and produced 29 drawings, Unfortunately, of these 29 only three remain, these were reproduced in an album of drawings and watercolors, published by Horizon Books in 1989. 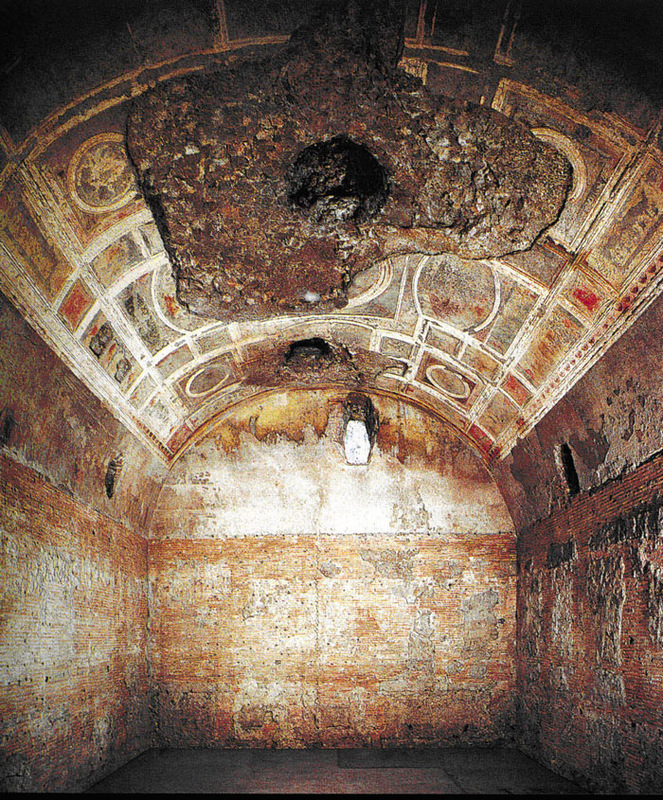 There is a large colored plate of the Golden living room ceiling, the main Division of the Domus Aurea. (this is my rough translation) I later found another site using this information. Guadalupi writes that the first artist to employ the grotesque style after the re-discovery of the Domus Aurea was probably Filippino Lippi, in some of the decorative work in the Frescoes he painted between 1489-93 at the Carafa Chapel of the church of Santa Maria sopra Minerva in Rome. In describing the diffusion of the grotesque style via Raphael's circle, the Fontainebleau school, etc., Pinot Villechenon adds that the style was introduced to the Spanish court by the Portuguese-born artist Francisco d'Ollanda (or, Francisco de Holanda), who had drawn meticulous copies of the Domus Aurea frescoes during a sojourn in Rome ca. 1538. This information lead me to another Italian Language site where I found some very specific information concerning Holanda, this site also has many photographs and gives the name of the rooms where they were taken, as well as the name of the room which Holanda painted, Sala dalla Volta Dorata. La sala della "volta dorata" è uno degli ambienti più importanti della Domus Aurea per via della sua decorazione che durante il Rinascimento italiano ha determinato una svolta epocale nella pittura decorativa di interni. Difatti, questa sala venne ritrovata nel XV secolo e gli artisti poterono ammirare e copiare le sue decorazioni calandovisi con delle funi attraverso fori praticati nelle volte, essendo le sale interrate: Baldassarre Peruzzi, Giovanni da Udine, Pinturicchio, Taddeo Zuccari e anche Raffaello. Oggi, purtroppo, della fastosa decorazione restano soltanto i colori di fondo e le campiture a stucco, mentre le pitture dei riquadri sono totalmente cancellate. Le conosciamo parzialmente grazie ai disegni dei pittori, come l'acquerello realizzato da Francisco de Hollanda nel 1538 e conservato nella Biblioteca dell'Escorial e quello di L. Mirri del 1776, la cui riproduzione con coincide con il primo e testimonia il degrado in cui si trovavano già le pitture. Incominciando da un riquadro centrale dove era affrescato il rapimento di Ganimede da parte di Zeus, oggi perduto, la volta a botte è divisa in una serie di figure geometriche ­ rettangoli e quadrati ­ incorniciati da stucco dorato di vario decoro e con fondi dipinti a colori vivaci, fra cui dominano il rosso e il blu. Nelle campiture erano inserite pitture con soggetti tratti dai miti più conosciuti, come quello di Fedra e Ippolito. Si pensa che l'autore di queste scene, dipinte in stile barocco e ridondanti negli effetti di colore, sia stato Fabullus, pittore di corte di Nerone ricordato da Plinio. The Hall of "golden time" is one of the most important of the Domus Aurea (rooms) due to its decoration (having been discovered) during the Italian Renaissance (which) led to a turning point in the Interior decorative painting. In fact, this room was found in the 15th century and the artists they admire and copy its calandovisi with ropes through drilled holes in the times, being the underground halls: Baldassare Peruzzi, Giovanni da Udine, Pinturicchio, Raphael and Taddeo Zuccari. Today, unfortunately, the sumptuous decoration remain (now) only background colors and backgrounds in stucco and paintings of the panes they totally cancelled. The (we) know partly thanks to the drawings of painters, such as (the) watercolor, made by Francisco de Hollanda in 1538 and preserved in the library of El Escorial and l. Mirri in 1776, whose reproduction with coincides with the first and testifies to the degradation they were already paintings. Starting from a central pane where he frescoed the abduction of Ganymede by Zeus, now lost, the barrel vault is divided into a series of geometric shapes - rectangles and squares ­ framed by Golden stucco decoration of various funds and brightly painted, among which dominate the red and blue. The backgrounds were included paintings with subjects taken from well-known myths, such as that of Phaedra and Hippolytus. It is thought that the author of these scenes, Baroque painted and redundant in color effects, has been Saidahmed1973, court painter of Nero by Pliny. To recapituale then this text is about the Room Sala dalla Volta Dorata, which was first discovered and visited by Baldassare Peruzzi, Giovanni da Udine, Pinturicchio, Raphael and Taddeo Zuccari. and although now the painting has nearly faded out of view we can know what it looked like thanks in part to the watercolors of Francisco de Hollanda who copied them in 1538 (now preserved in the library of El Escorial?)... now here is the interesting part, the author of the first site mentioned at the beginning of this page has posted a reproduction of Holanda's watercolor, the reproduction appears to be a photo of the watercolor that has been reproduced in a magazine or book and is not completely in focus but that isn't too important for the moment. In the comparative diagram below I compare Holanda's watercolor with Plate 42, click on this diagram to see an enlargement. Compartive Diagram 1 - Plate 42 from 1776, Vestigia delle Terme di Tito e loro interne pitture.. vs Francisco de Holanda, 1538 watercolor. 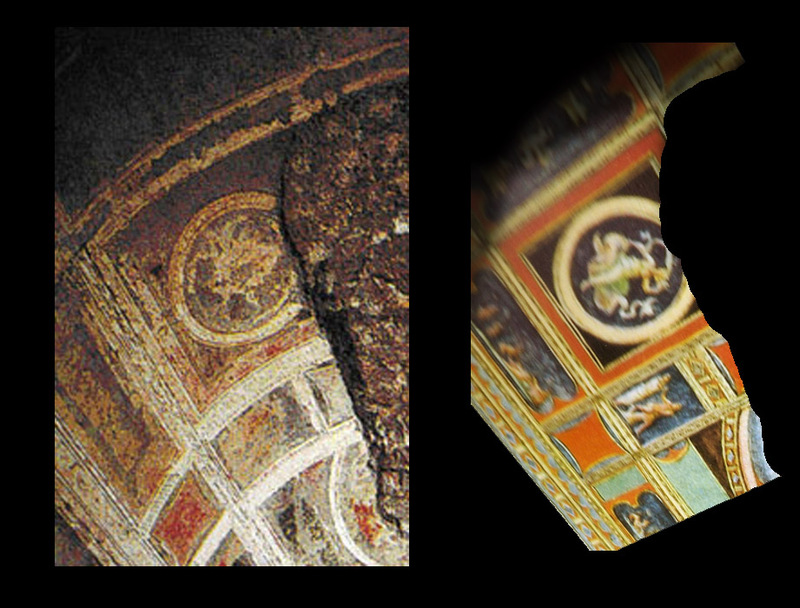 As we know from looking at the actual photographs of some of the remaining frescoes at Domus Aurea, for these two decorative assemblages to be so similar, we must assume that they are both portraying the same fresco panel. Domus Aurea, Sala dalla Volta Dorata? 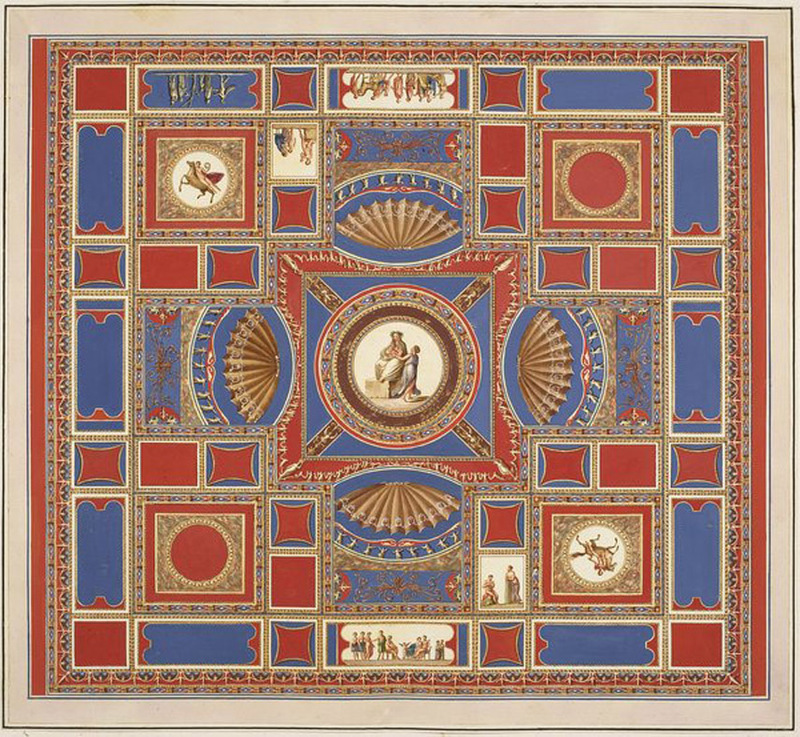 If you search with with google for images of Sala dalla Volta Dorata, you find that there are a number of different rooms all being called by this name, however, the ceiling of the room shown here certainly has a lot in common with Holanda's watercolor and Plate 42. 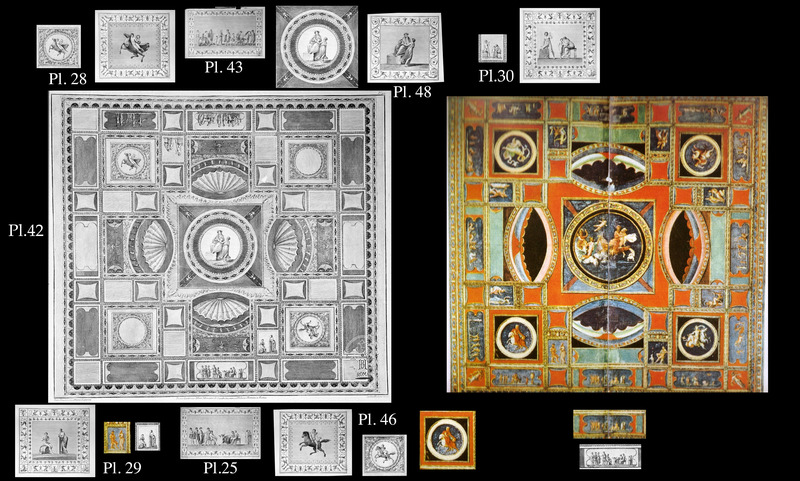 Comparative Diagram 2 - decorative section of a Domus Aurea fresco panel vs Holanda 1538 engraving. 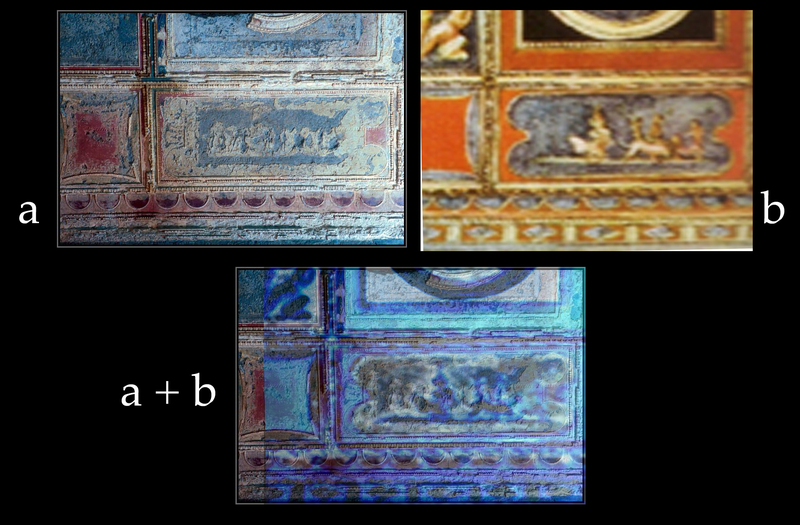 Comparative Diagram 3 - decorative section of a Domus Aurea fresco panel vs Holanda 1538 engraving, with an inverted color overlay. In Comparative Diagram 2, I have taken a strip of the decorative panel from the photo and placed it alongside of a strip of panel from the Holanda watercolor. I have also distorted the Holanda strip to give it a perspective view. Without a doubt these two panels are very similar. 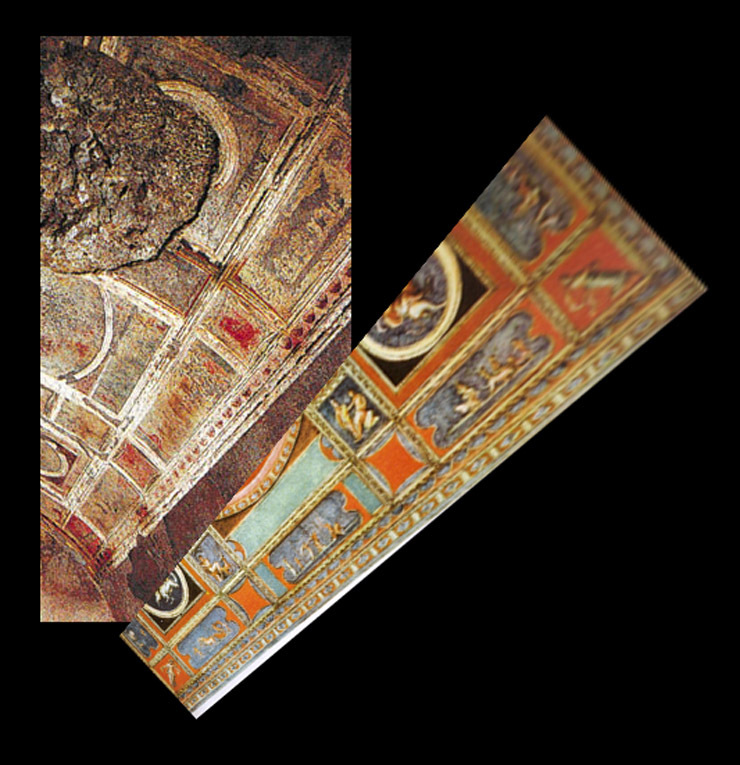 Fortunately there was also a close-up photograph of this panel and I have made an overlay comparison in Comparative Diagram 3. To produce the overlay, I have inverted the colors of the Holanda detail and made it semi transparent so that we can see the photograph underneath. Here we see some spectacular similarities, the outlines of the red square, a deformed trapezoidal shape, match perfectly, also the diamond shaped pattern on the outer border, which is barely visible in the photo becomes more apparent. (click on the image to see an enlargement). Many shapes and borders are obviously the same, they may not line up perfectly which is certainly to be expected, considering how variable much of the decoration is in the general collection of these frescoes. This amount of matching pattern and shape is virtually a miracle, who could doubt that this is the same panel? However there are many unanswered questions here, and most are complicated by Plate 42. 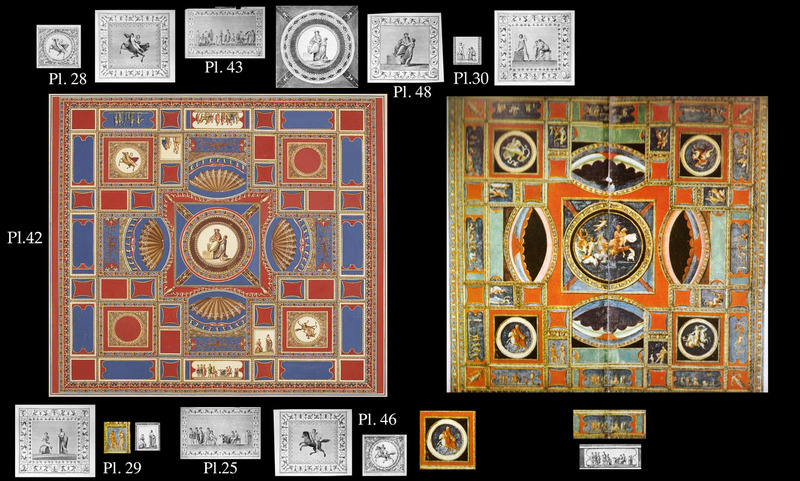 As previously stated, many of the decorative details found in the Plates from Vestigia delle Terme di Tito e loro interne pitture, are pure inventions, let us return to the two examples, Plate 28 and 46, both derive from Plate 42, where they appear to be somewhat different and would require an enclosing circular border? Plate 46, is very interesting because it appears to show the same painting as that found in Holanda's watercolor although placed in a different corner. We must remember that there are more than two centuries separating these attempts to reproduce the frescoes of Domus Aurea, and another two centuries passed before these photographs were taken. Could this even be the same panel? If it is a different but nearly identical panel that was later illustrated in Vestigia delle Terme di Tito e loro interne pitture, why do we see matching details in the Holanda watercolor? Personally I doubt the existence of another nearly identical panel that has vanished without a trace. Also the scant remains that can still be seen in the "other" Sala dalla Volta Dorata do not match either of these engraved copies. 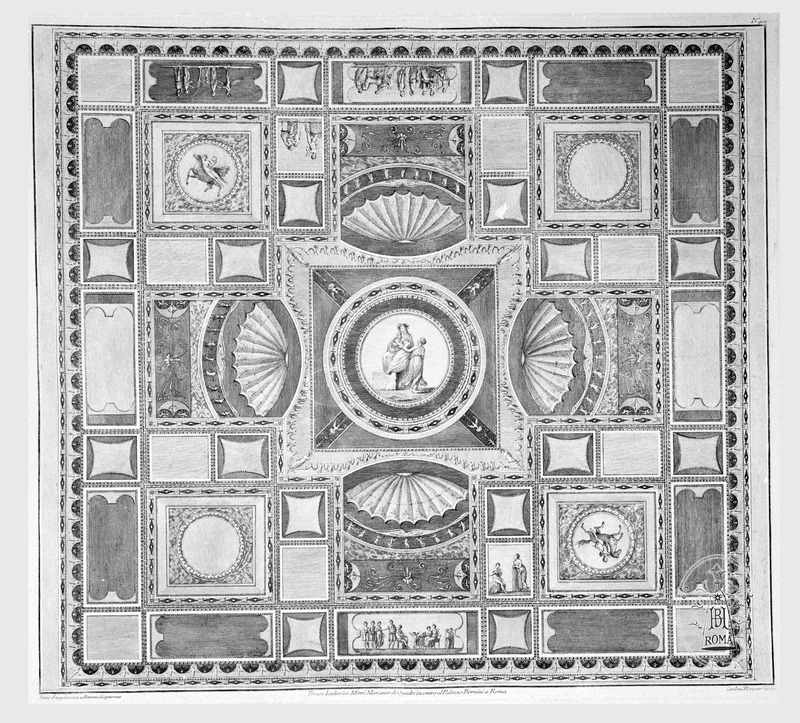 It may be that there were no holes in the ceiling when Holanda made his drawings, and that the team of Vincenzo Brenna, Franciszek Smuglewicz, and Marco Gregorio Carloni, used the panel as a decorative framework to display a number of scattered paintings found in the various rooms of Domus Aurea. On the next page we are going to delve even deeper into the details of plate 42 to discover something even more startling. Comparative Diagram 4 - decorative section of a Domus Aurea fresco panel vs Holanda 1538 engraving. created by L. A. Miller in collaboration with Mathilde Durand.